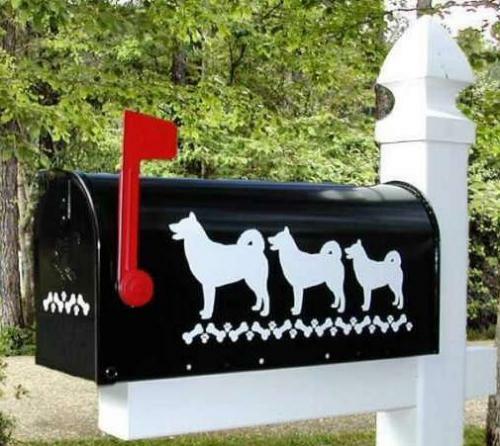 Alaskan Malamute Dog Mailbox- our Alaskan Malamute Dog Mailbox is available in two sizes - the standard or large - both styles made of galvanized steel. Our Alaskan Malamute dog mailbox features your favorite dog breed - the Alaskan Malamuter - along with the cute bone and paw print trim on both sides of the mailbox. The door of the mailbox has the bones and paw print border along the bottom. 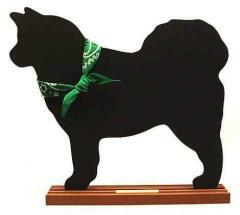 Our custom Alaskan Malamute dog mailbox can be personalized with your name, address, or kennel name on both sides.